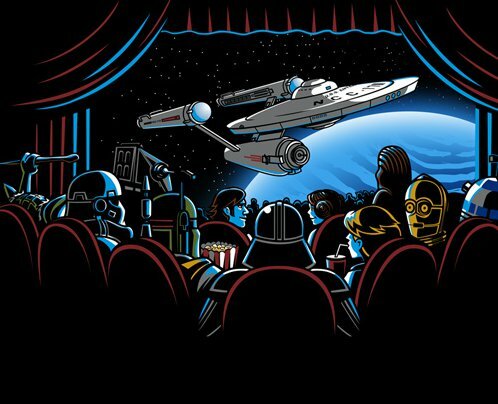 Star Wars T Shirts: I had to break this out of the movies tag, so it could be its own world, because there are about 3 trillion Star Wars designs out there. Lots of good stuff if you’re a fan. This is kind of great. However, I have one request. Wait until you’re like 90 years old to start wearing it. Why, you ask? Because if you have a fresh face with smooth skin it just doesn’t look right. You need to be wrinkly and foldy and have a slight green tinge like all old people have. Bonus points if you have random hairs sticking out of moles, ears, and nostils. This is what they call an absurdist design in the t-shirt business. Placing known characters (in this instance from Star Wars) into odd situations like a rodeo. 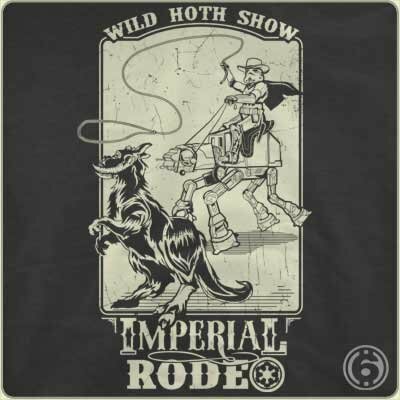 In fact, that Storm Trooper has a cowboy hat and looks like he throws a mean lasso. That, my friends, is absurd, and I’m not to sure Mr. Lucas is happy about it. 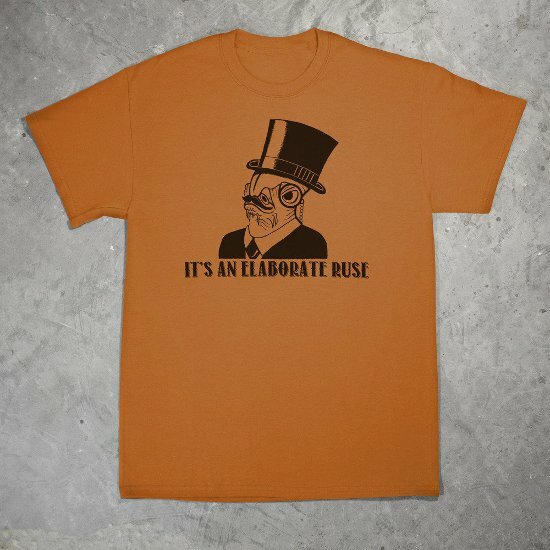 Pretty cool design right here if you’re into Star Wars, which I know a couple of you readers are. 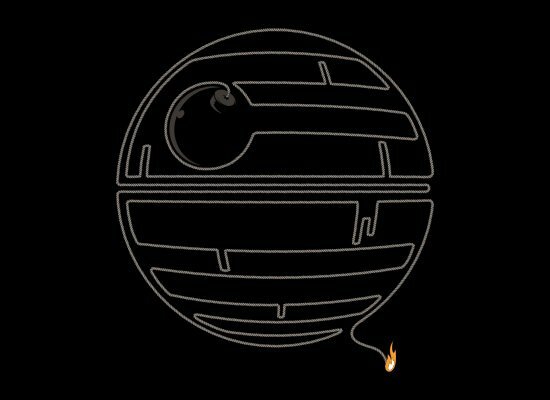 Well, Star Wars mashed up with classic black, round bombs with long wicks. If you’re into that type of thing you would be an absolute fool not to purchase this shirt. When you receive the package you’ll probably reach the highest state of happiness you have ever known. Do it! 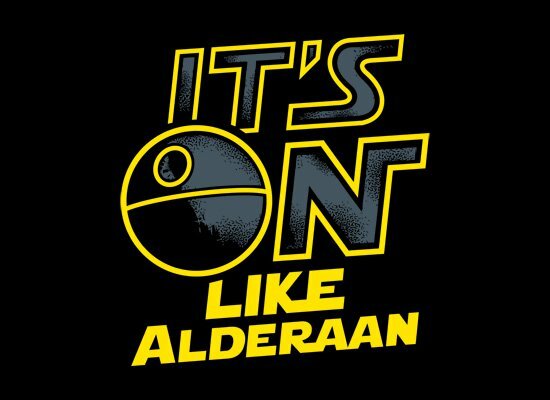 I wonder if, now that Star Wars is owned by Disney, the fair use rights will be more lenient or less. Back in the final days of George Lucas’ reign it was getting pretty brutal for Star Wars-inspired designs. Maybe they were just trying to clean up as best they could prior to the sale. Disney seems like it could go either way. Step Brothers! John C. Reilly! Will Ferrell! Hairy balls! Crotch party! Yoda! First Beer! 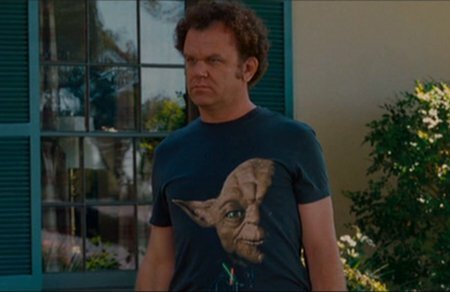 Nice scene and the perfect touch is the shirt that Dale is wearing with the big old Yoda head coming out of the darkness. Amazing shirt!!!!!!!!!!!!!!!!! 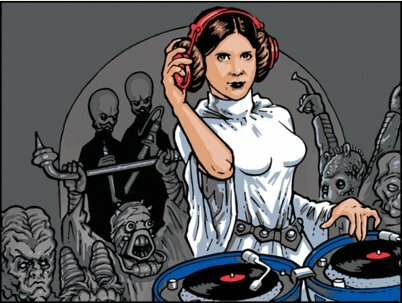 Princess Leia likes wearing the cans so much she trailblazed a new hairdo to celebrates them. The ponytail spiral. You don’t see this in the movies much but she really can spin. The other thing that is not revealed in the movies is that R2D2 can convert into dual turntables. Pretty sweet. That room is pumpin’. 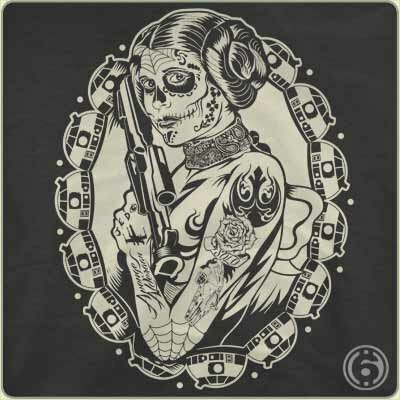 Whoa…now that’s a different take on Princess Leia but somehow it seems to work. I could see her getting all tatted up. Can’t you? Love the R2D2 head detail framing our lovely heroine. Nice little twist on the It’s a Trap meme that has blossomed from the classic Ackbar scene from Star Wars. Let’s rework that scene with a sophisticated Englishman in a top hat, monocle, and moustache, and switch up the dialog to match. It’s an Elaborate Ruse is definitely what you would get. Funny stuff. Never thought I’d see Ackbar so tidy. You gotta like the resurgence of ugly sweaters even if it’s mostly driven by irony. 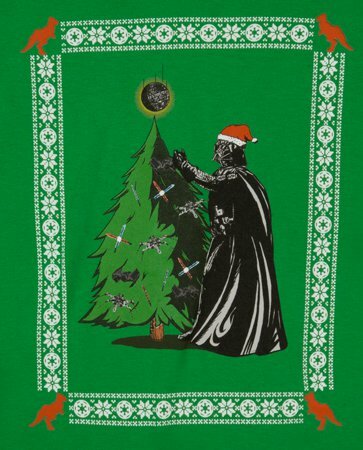 This green sweater featuring Darth Vader topping the Christmas tree with the Death Star is both spectacularly and super festive. What more do you want in a garment to wear during the holiday season? 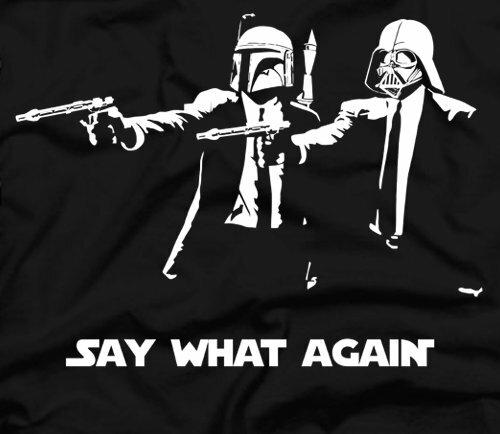 It’s a Star Wars and Pulp Fiction mashup. The power of this combination threatens to rip the very fabric of the universe. Tear a hole for a glimpse at the other side. Careful when you wear this. In fact, might I say, always wear this shirt responsibly. Now, this is a shirt I can get behind. It’s absurd and I have actually seen Star Wars and know the story of Mickey Mouse, so it really, really resonates. Like deeply. Too the tip of my scrotum. Deep. No really. I love it. It makes me chuckle immediately when I glance at it.